American scientists at an Arctic research station discover a spaceship buried in the ice. Near the crash-landing site, they find what appears to be an extraterrestrial being trapped in the ice. Inadvertently, this mysterious creature is revived and chaos and mayhem ensure at the remote station, with each individual fighting for his life against this … thing from another world! I usually say that people who were not present during a film’s initial theatrical run cannot possibly comprehend what it was like to experience the movie in that specific time and space. Some movies are so much about a specific moment and time that it is impossible for modern eyes to absorb the impact the movie had on its intended audience. Filmmakers don’t make movies for people twenty years into the future; they make movies for the “here” and “now.” Therefore, no matter how brilliant a movie is, there is always going to be something that a new generation of moviegoers will find hard to digest. However, on occasions, certain films retain their original aura and ability to move the audience, despite the passing of time. 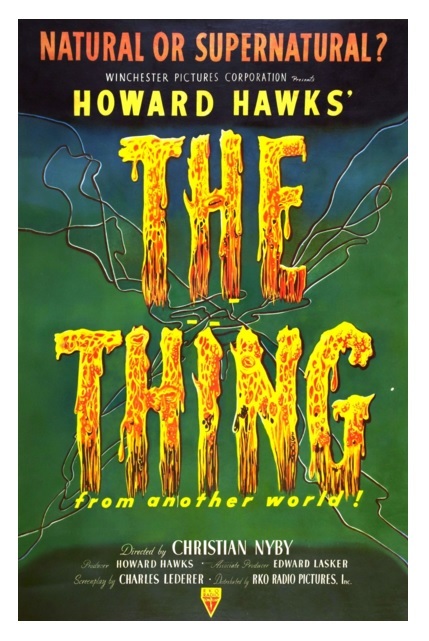 The Thing from Another World, written by Charles Lederer, based on John W. Campbell’s short story Who Goes There?, and directed by Christian Nyby (The Hitch-Hiker), is one of those rare films that have stood the test of time, while other movies from the same era have disappeared into oblivion. 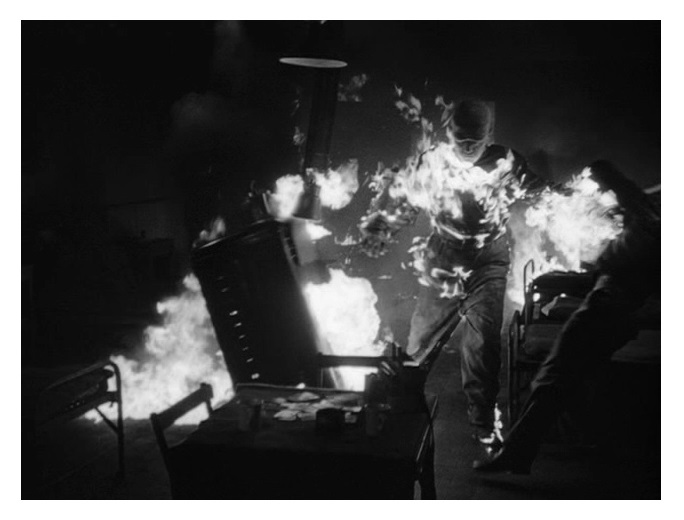 The Thing from Another World is no longer a scary film, but it is so well made that despite some dated moments, the movie remains an intense viewing experience. 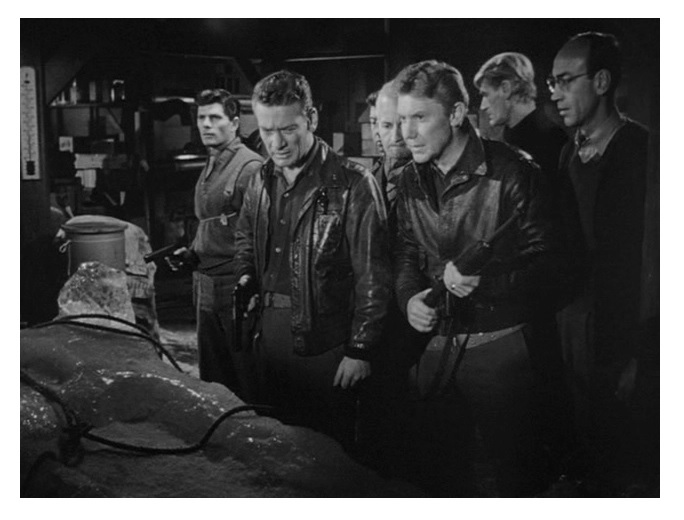 Of all the classic horror/science fiction films from the 1950s, The Thing from Another World seems to be the one that is still as effective as ever. It is a quality production all the way and one of the most entertaining films of its type. Although Howard Hawks (Bringing Up Baby and His Girl Friday) only produced the film (rumors persist that he directed sections of the movie), the filmmaker’s influence can be seen all over the place. The fast, over-lapping dialogue, the camaraderie among co-workers, the feisty female character, etc. — these are Hawksian elements. Remove the monster, and you are left with a fun Hawks movie. That being said, the film’s anti-science attitude is at times jarring. There is zero intellectual curiosity — the idea is to shoot first, ask questions later — and the only character who is aware of the significance of the discovery is portrayed as cold and totally unsympathetic. This is perhaps a reflection of post-war tech-anxiety. The Thing from Another World was beautifully shot by Hawks’s preferred cameraman Russell Harlan (Red River and Rio Bravo). The great score is by the always-imaginative Dimitri Tiomkin (High Noon). 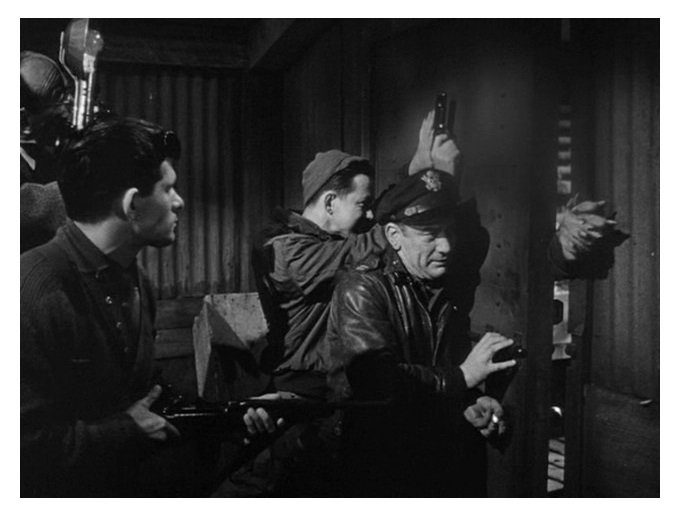 The cast includes Margaret Sheridan (film debut), Kenneth Tobey (It Came from Beneath the Sea), Robert Cornthwaite (The War of the World), Douglas Spencer (Shane), and James Arness (TV’s Gunsmoke) as The Thing. The Thing from Another World works on different levels. The film’s themes and structure rise above the specific and offer different layers of ideas worth exploring. This is the secret of The Thing from Another World’s undying appeal, and the main reason why more than six decades after its release, the film is still regarded as one of the best examples of the horror/science fiction genre. Remade in 1982, and partially reworked in 2011. B&W, 87 minutes, Not Rated. I love this one I saw it on TCM when I was in the states. I have it in my collection. John carpenter was a guessed on TCM with Robert Osborne The them was the 3 favorite films of Carpenter. Carpenter said that was one of his favorite film. Of course he remake it in 1982 love the remake too. But the original is the best. Nice review. I’m planning to revisit the 1982 — one of the best remakes out-there. I love these classic monster/alien films. this isn’t necessarily one of the stronger ones, but it is still enjoyable. I have never even heard of this movie. Thanks (I just read your review). I’ll try to find it.